"Let's get away from the city… It's miles away from everything." Lionsgate has released the official trailer for a thriller titled Traffik, the latest from writer/director Deon Taylor. The film stars Paula Patton and Omar Epps as a couple who set off for a retreat in the mountains, but are accosted by a biker gang, who then go after them once they reach their isolated vacation rental home. The full cast includes Laz Alonso, Roselyn Sanchez, Luke Goss, Dawn Olivieri, Claude Duhamel, and Lorin McCraley. It looks like your standard angry-white-people-home-invasion thriller, where the nice people have to fight back to save themselves. I'd rather go see Breaking In, which looks like a much better twist on this concept. Have a look. A couple (Paula Patton, Omar Epps) off for a romantic weekend in the mountains are accosted by a bike gang. Now, alone in the mountains in an isolated rental home, Brea and John must defend themselves against a group of conspirators, who will stop at nothing to get the phone, destroy the evidence it holds and kill anyone who would tell their secrets. 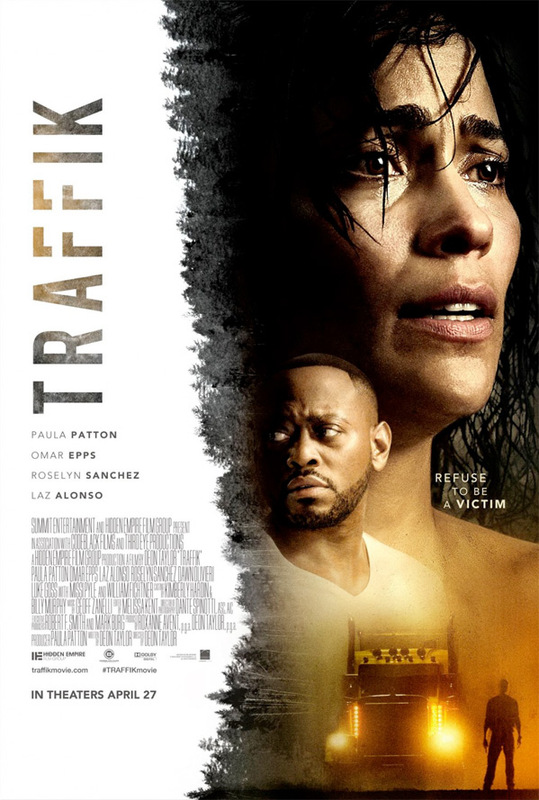 Traffik is both written and directed by filmmaker Deon Taylor, of the films Dead Tone, The Hustle, Nite Tales: The Movie, Chain Letter, Supremacy, and Meet the Blacks previously. This is produced by Paula Patton, as well as Roxanne Avent and Deon Taylor. Lionsgate will release Deon Taylor's Traffik in theaters starting on April 27th, 2018 this spring. Anyone interested?